Namakkal district was created by bifurcating the erstwhile Salem district and created in 1997. The Geographical area of the district is 34,29,671 hectares, which is divided into 5 taluks, namely Namakkal, Paramathi, Tiruchengode Rasipuram and Kolli hills. Parambalur, Trichy and Salem on the East. Karur on the South and Erode on the West. Generally hot and dry with a low degree of humidity. Receives scantly rainfall. The average annual rainfall is only 900 mm. The frequent drought caused by the failure of the monsoon adversely affect the dry crops depending upon rain fed tanks for irrigation. Parts of pallipalayam, Kabilarmalai, Paramathi & Mohanur blocks are being irrigated by Cauvery River. Cattle & Other Live stock 1149158 Nos. 3 Power Supply There is no power generation in the district. However, the district is supplied power by Tuticorin and Neyveli Thermal Power Stations of the neighboring districts through State and Central grid. 4 Transport The district is well connected by roads with major commercial centers of the State. 5 Finance -Banks There are 136 commercial banks branches and 24 Co-operative banks available in the district. Top 10 Industries - Suitable for the district. Sago & Starch Rs.50 lakh Sendamangalam, Rasipuram & Namagiripettail. Bakery products like biscuits, bun etc. Injection moulded plastic items for domestic and industrial uses. Braided cords. Tapes and ropes. Leather bags, purses, belt etc. Tube light chokes and starters. Block wise details of large scale industries sector-wise showing the number of units, investment, employment and installed capacity. Spinning Mills fully automatic & centralized Air/conditioned units. Non-conventional Energy producing unit (from beggose) - Mohanur. Other Potential non-farm sector type of industries in the district. Raw material based Sago, Rice Mills, Flour mills, Bakery products, Milk-Products, Extraction of edible oils, PVC Pipes, Tube lights, Cotton fabrics, Cotton yarn, Ready-made Garments, Egg and Egg products. Skill based Lorry body building. Export oriented Raw Granite, Polished Granite, Cotton fabrics, Garments. Turkey towels & Eggs. In Micro Enterprises Sector there is a possibility of more than 15% growth per in food, Lorry body building, Textile, Poultry feed and Fly ash Bricks Industries. In Small Enterprises sector there is a possibility of 10% per annum growth in Auto looms (textiles), Sago, Milk Chilling and Milk products industries and Cold storages. In Medium Enterprises sector there is a possibility of 10% growth in steel Industries, glucose out of starch (sago) Industries and medium scale starch industries. Steps to be taken to increase the industrial growth in the district and to improve the export performance. 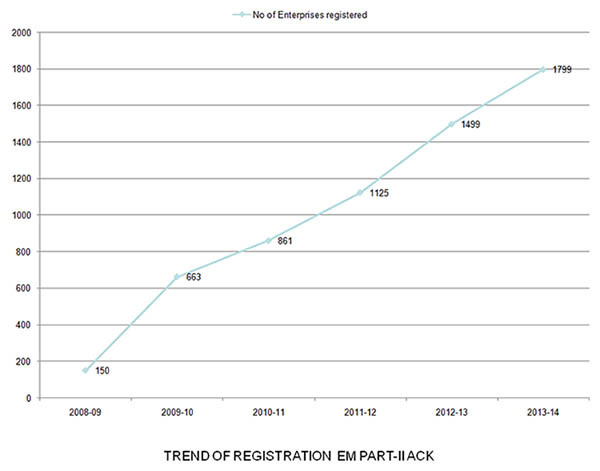 More number of seminars/publication about the schemes of the Government to the needy entrepreneurs. Effective discussion between the financial Institution and the MSME promoters – Effect once in six months to sort out the issues. Successful Co-ordination with MSME Association and other Agencies in the Development of Industrial Sector. The procedures of Export and the benefits of the Export should reach the public early. Excise Department, Export Credit Guarantee Corporation should take high initiative to make export simple and problem free among the entrepreneurs. NPA cases should be dealt without hurting the minds. Exporters should be safeguarded against the fluctuation in Dollar rate. Moreover support price should be maintained. TAMIN may take up marketing facilities for the Granites available in Sivakasi area. Guidance Whom to contact in namakkal District? Udyog Bhavan, New Delhi- 110 011. 6 Registration under Factories Act.